"Anything celtic would be nice" I told her and "some geometric and symmetry"
"Gum biodh ràth le do thurus." = May your search be successful. This saying is now written in Ogham on the outer ring. The only question remaining was the back. I thought and thought and got the idea to invert the front. Haven't seen this before, i finished the artwork you can see above. of course trackable plus icon! I do not know exactly the number of edition, will have to wait for the samples. After getting the "ok" from GC and receiving sample coins I will start reservation/preorder. Final price depends on total amount of minted coins. More coins = lower price. Currently, with a total edition of 150 coins it will costs 9.00 EUR (incl. 19% TAX) and for 300 coins, the price is 8.00 EUR (incl. 19% TAX). Intermediate not excluded! Shipping not included! Don't forget: If you are living in a non-EU-state, you don't have to pay 19% TAX! Once I have pictures I will show you! Thanks for reading, hope you'll like this coin. Ogham! Sweet! I almost put Ogham on a coin. I like this one. I like the Inverted idea of the coin... Had you considered reversing the image on the back?? I've been contemplating that idea with a non trackable of my personal. That way, the raised portions on one side would line directly to the same recessed portions on the other side. I don't know anything about the procedure of making a coin. But making the back look like it's the opposite of the front would require manual interference to get back in line with front. Great design! I will keep an eye out for this one, that's for sure! Looks great. It is already on my wishlist and I have just registered to your e-shop. Yes, I had this idea too. Which backside do you like more? My question from an earlier post stands: is it possible to get them exactly opposite of each other? Love 'em in either version. Awesome design! I guess I like the second option even better, but that's very close! Maybe if you reverse and invert the whole design but keep the text translatable, that would be even greater! I'm looking forward to seeing the coin come to life! front-level 1 is back-level 3 and front-level 3 is back-level 1 . Is that what you are asking about? Funny you mention that as it's just the idea I had after reading about Jackalgirl's Yang tiger. Stefan, if you're going to have what will look like the same image at first glance on both sides I think it will be extra cool if one side is the die and the other the imprint. It would be a new twist to the many celtic designs that have come out this past year. PS. I wouldn't worry about the legibility of the die or reversed side.... it adds to the puzzle. The inverse on the back is a great idea. And the quote is perfect. Nicely done. Has there been any progress with this great looking coin idea? I like it. I think you have too much red on it though. I would be more selective with the color rather than white washing the whole surface. Will be moving within next two month and my job gives me not really much spare time to finish the artwork. In addition to this, I'm not really sure about platings and color .... probably I'll start a cointest. Nice looking coin artwork. I would be interested as well. Hi Wenzelbub! Have you been moved? And is there any time left for the artwork? Looks good! Is this direction that all new coins are heading? Love the design. Nice Job, can't wait to see the real thing! I seriously can't wait for these coins to go on sale! I personally think it will do well. I like the design and the quote. I'll take two for sure. Groundspeak approved it and mint sent me an offer that looks nice. I'll order 4 samplecoins, after getting them I'll post futher details. Congratulations, Stefan, on the approved design and completed artwork! Now if we can just speed up time a bit, so we can see these "in the flesh." Please keep us posted, on the coin sale AND the cointest. Awesome design! Please let me know when they go on sale. I definitely would like one. Thanks! Nice! Looking forward to seeing the samples. Way to go! I'm still a big fan of your design! I can't wait to see the coins in person. Definitely a must-have! 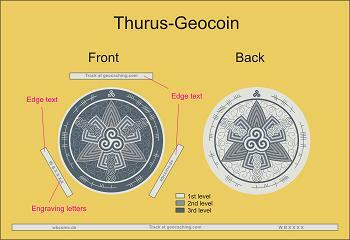 I'll start cointest (You'll have to design your own Thurus-Editon) after getting pictures from mint of samples. Beautiful and great design, I`ll keep on watching. These are beautiful coins! I'd love to purchase one! Keep us informed when they are for sale. I'll ask mint if these are suitable for are 2" coin (now it's 1.75") but I don't think so. Mint told me a 2" version will be more detailed. They will make an artwork till tomorrow. After some emails with mint and several artworks my girlfriend and I decided to use the 1.75" version. Samples are ordered and will be shipped around 20th.. probably I'll have pics from mint at this time too. After receiving samples I'll let you know about the available versions and selling. I dither between presale and normal sale. I'm unsure about total amount of required coins for a normale sale. More coins = lower price for you but more risk for me in probably not selling them. Sorry for not really good picture qualitiy, had no daylight, just too late. Announced cointest will start on sunday too! Futher details will follow next days. OOH!! I am loving the antique copper version!!! The other two are super nice too ! Looking forward to the cointest. Those are stellar! Well done! Just called my girlfriend and asked her about the mystery-edition. We made a decision and here the non-mystery-edition, called the "Rainbow-Thurus". Purple in the middle around triskelion and on the back will be replaced by brighter purple (transparent #5 instead of #9). PS: This will be a edition available in presale, for sure! They turned out realy good! Oooh I love the rainbow version!! So colorful! BTW: Any idea for an icon??? They came out looking really good and I'm going to be interested in a couple for sure but I hope you don't decide to go the pre-sale route.